Verbal arguments with your spouse or partner can start over something as simple as a cell phone or a set of car keys. Tempers can flare and a heated verbal exchange can ensue. 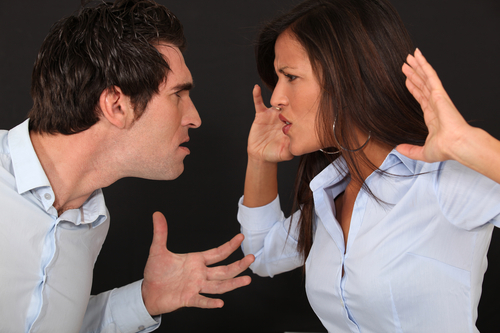 Resolving an argument with your spouse may not be something you want to do. Maybe you’d like to get the upper hand on them by calling the police? However, before things get too far out of hand, you need to remind yourself of what happens when the police get called for a domestic violence dispute. It could end with one or both of you going to jail. Police are trained to treat each domestic violence call as a high priority or life-threatening situation. This is because 22% of all “in the line of duty” deaths happen while answering a domestic violence call. Also one-third of all female fatalities are committed by an intimate partner. Even if the call is canceled, the police will still show up to investigate. The police are also trained to observe the situation and utilize discretion when coming close to a residence in question. They don’t always use their sirens, flash any lights, and in some cases, they won’t even turn on their headlights. If a physical altercation has been witnessed by the police or if there is evidence of an assault or battery, a mandatory arrest will be made. This tip is easier for couples that have been together longer than couples who have just met. Try to learn to recognize the signs when your spouse or partner is getting angry. The volume of their voice might rise. Their hand gestures might become more erratic. Some people’s faces could begin to turn red, others may have veins that become visible, and some could contort their face into visible annoyance. In some cases, your spouse or partner might go completely quiet. Leaving is the best thing you can do to diffuse a situation. If you are not intoxicated, get in your car and go for a drive. Visit a family member or someone that you trust to give your spouse or partner time to cool down. If you are unable to drive and you live in a safe neighborhood, then go for a walk. Give you and your partner some space to calm down and a chance to remind yourself what could happen if the police get involved over a verbal dispute. If your partner follows you, politely tell them that you need some time alone and you will resume the conversation when you get back. Conflicts arise because two people have differing views of an idea or situation. In some cases, it just isn’t that important to be right. Take a step back from the situation and let your spouse or partner explain their side of the situation. Listen and let them get out everything they have to say. Once they have stopped talking you should use the phrase “I understand that you feel…” This is a great way of letting them know you heard everything they wanted to get off their chest. Domestic violence charges are a serious matter. Prosecutors pursue criminal charges to keep death rates down and abuse to a minimum. If these tips don’t work to resolve the verbal argument and physical violence has resulted, call the police immediately. They are trained to handle the situation and make sure everyone comes out safely. Getting the police involved in a verbal argument and being charged with domestic violence is a stressful and complicated matter, especially if you are innocent of domestic battery. Having an experienced domestic violence lawyer on your side will make sure your truth is heard. Jesse Kalter has obtained countless dismissals, not guilty verdicts, and reduced charges due to his tenacious pursuit of justice. He is available day or night to make sure you get through this exceptionally trying time. Jesse Kalter is available to serve the people of Reno, Sparks, Carson City, Fallon, Fernley, Dayton, Yerington, Douglas County, and all other Northern NV rural counties.